“Thank you for the sghetti,” my daughter prayed. 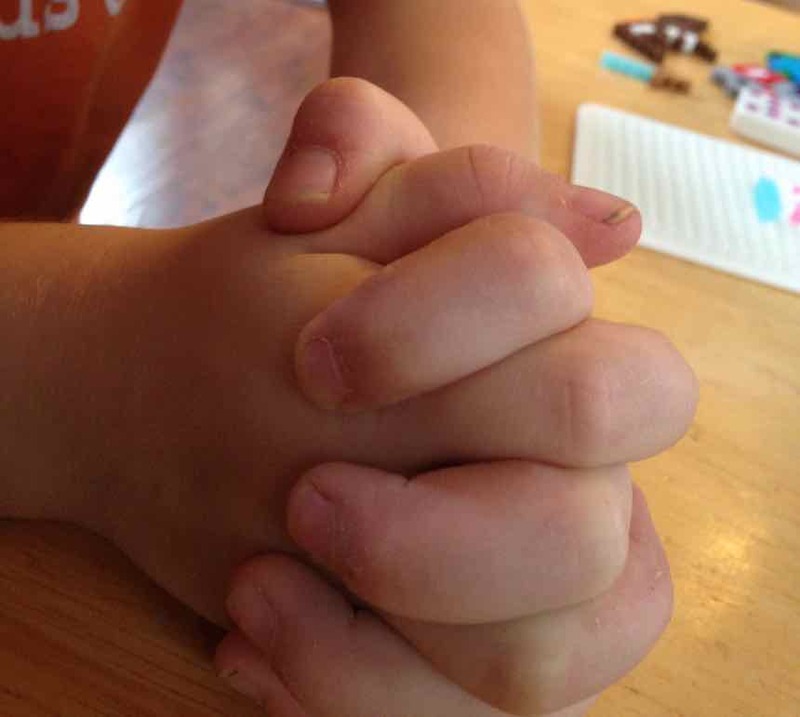 Her little fingers entwined into a ball were folded against the edge of the kitchen table. Her forehead puckered and her eyes squinted. Through narrow open slits she spied the set table in front of her. “Thank you for the plate.” Her cheeks twitched from the concentrated effort of nearly but not completely closed eyes. I opened one eye and met one slim peek from my husband. We squeezed down laughter that threatened to boil over. As we enter the season of thanksgiving, I love the emphasis on remembering, being aware of the little things, the spoons and forks of life. But beyond the surface, true gratitude embraces a profound spiritual significance. There were ten lepers that Jesus healed. Only one returned to thank Him. It’s a great passage to open the month of November, not just because of its reminder to be thankful, but because of our constant need to recognize a Sovereign God in everyday life. Ten lepers had so much in common. Yet in their similarities, each had a different story, some likely lost families, jobs, prestige and respectability. They became outcasts of society, set aside, with a future that looked grim. They must have known of Jesus’ reputation. Perhaps they’d heard he’d fed 5,000 with five loaves and two fish, or that he raised a little girl to life. Maybe they knew he calmed waves and cast out demons. “Jesus, Master, have mercy on us,” they shouted from a distance. Can you imagine their hope as He turned toward them, where they stood grouped aside, their own little leper colony, unable to get too close? They immediately obeyed, undoubtedly overcome with the joy of the command. They knew what it meant, because by the religious law they needed a priest to declare them clean. Their lives were about to change, a return to normalcy, health, family and society awaited. And they ran toward it. As they went, obeying Christ, healing occurred. The putrid skin of their companions cleared. Their own turned smooth. I can picture ten former lepers, lifting limbs, looking, shouting and pointing at the miracle, hurrying on their way to the temple. And I imagine one who stopped. One who who stooped to look at his feet, his hands, to turn palms up and over, up and over. I imagine him looking ahead to where the others ran to freedom and turning to look behind at the figure of Christ, where the healing originated. I picture overwhelming gratitude that made him want to shout, but also the wonder of the moment which made him want to whisper. He may have called to the others, it’s not written in the passage, but while nine became smaller in the distance ahead, that one man “when he saw that he was healed, returned and with a loud voice glorified God.” Luke 17:15 (NKJV). He glorified God, Sovereign over sickness and health, events and occurrences, nature and time. The magnitude of God in the man Jesus brought him to his knees. True gratitude recognizes the Person as greater than the miracle. It is possible to get that confused, to seek an experience but not a Savior, to be distracted by temporary and neglect eternal. Only one recognized a larger reality and returned to give glory to God. And he was a Samaritan. His status even before the disease was less, his acceptance among men iffy. The other nine, so enamored with returning to normal life and society forgot to bow before The One Who had the power to heal not just physical bodies, but give spiritual life as well. “…Your faith has made you well.” Jesus said. But weren’t they all healed? Without Christ our souls are diseased and without hope. We are like the Samaritan leper, needing spiritual healing to remove the stain of sin from corrupted hearts. Thanksgiving is a great time to count our blessings and name them one by one, all those little pieces of life over which God sovereignly reigns but we take for granted. True thanksgiving overflows in grateful humility. Let your attitude of gratitude lead you back to the feet of Jesus. Love the phrase “we squeezed down laughter.” Perfect ! I love the way you intertwine your family stories with Bible stories so seamlessly! Yes, I so agree: “True thanksgiving overflows in grateful humility.” Thank you for this! So thoughtful and love you tie in to worship from a grateful attitude! Happy to share this wisdom! I could really see the guy looking down at his hands flipping then over and over again in awe of the drastic change. I hope we can all be more like him. Thank you for this reminder.